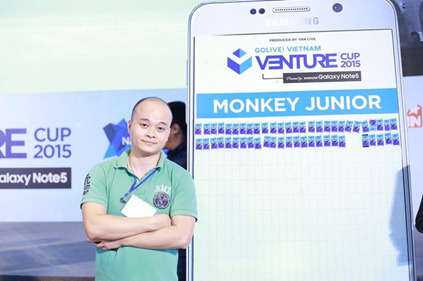 Monkey Junior is the first and the only Vietnamese project which got in the final to compete with other 14 projects. With many superior advantage, Monkey Junior was regarded to have extremely potential growth and won the first prize by a landslide. To be precise, Monkey Junior is a program that teachs 0 to 10 years old how to read and speak. This program possesses a giant database of multimedia (image, Video and audio) and many interactive features that makes kids learn and think in the identified language. After merely 7 months of debut, Monkey Junior became the most downloaded reading tutorial application on both App Store and Google Play, and belongs in the top 100 downloaded education application in many countries such as USA, Canada and Vietnam at nearly 1 million downloads. Even though Education is not the first path Hoang has picked to start his career, but through personal experience of a father and the love for challenge and creative spirit and his own abilities, he made a big leap in his career by making Monkey Junior. In his answer, he mentioned that TFI played a big part in this success. 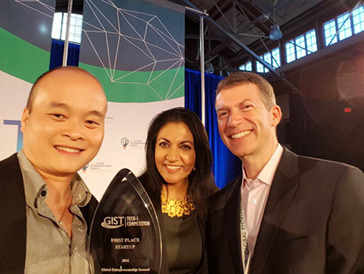 A part of Founder Institute’s network, who was founded in Silicon valley and possessing Headquarters in over 85 cities and 60 countries, TFI were created with one aim in mind: to help startups reaches the international market. Until this point, TFI is one of the few education firms with successful fund gathered reaches millions of USD. He also adds that TFI’s learning system is really well laid out; each session is about a part in starting up a business. Learning topic, especially classes about legal issues, team building and the process of developing a program, were especially important for people with determination to start a business like him. Specifically, through TFI, he met and connected with many more; improve his network and reaches out, especially people with the same dream. Here, all are ready to share and help each other out in solving issues that one would normally face when starting a business and having the best chance of meeting for the “Angel” investors. Topica Founder Institute is the Startup Accelerator Program of Topica Edtech Group, the leading online education group of South East Asia, with more than 1000 staffs and 1800 lecturers in various offices across Bangkok, Da Nang, Ha Noi, Jakarta, Manila, Singapore and Ho Chi Minh City. TOPICA Uni provides high tech basis and service for 11 University in Vietnam and Philippines for their high quality online courses. Topica Native is the program about learning to speak English like a native for Vietnam, Indonesia and Thailand. Topica Founder Institute is the only Founder Institute that exists in 60 countries and having headquarter in the Silicon Valley, and the only Accelerator in Vietnam receiving total 15 million USD investment. Following the success in Vietnam, in 2016 Topica Founder Institute has started a program in Thailand with the first 36 founders chosen for the first course.